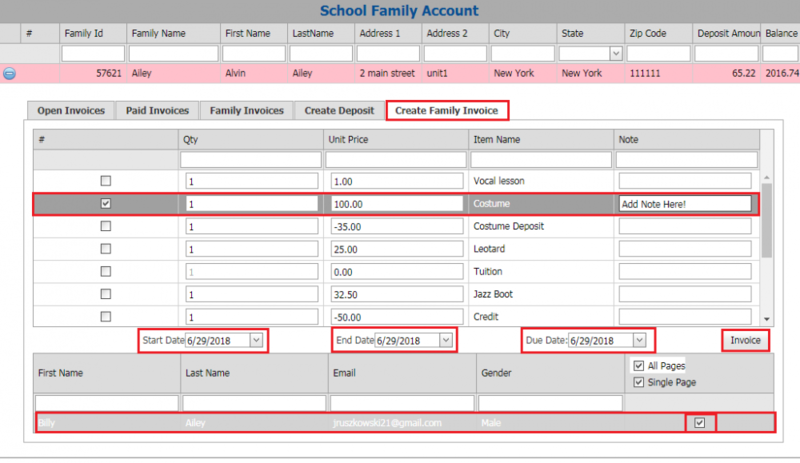 Creating a Family Invoice from the Student Grid. You can now create a Family invoice from the student grid. Click on Student at the top. Search for the student by the last name or by the family name (under the Family column on the student grid). Click the Family Last Name/Number Link in the Family column (purple). 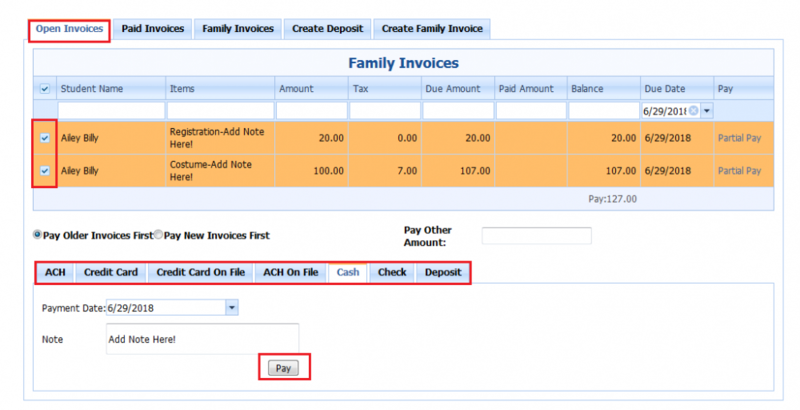 Click on the Create Family Invoice tab. A list of income categories will be displayed. Income categories are the billing line items. Prices are pre-defined but can be overwritten when invoicing (except for Tuition). To override an amount, click in the box and change it. You can also include a note for a specific invoice category. Just enter the note in the last column. The note will be included in the invoices and statements. Frist, enter the Start Date, End Date and Due Date. Choose the students you are creating invoices for at the bottom. Check the boxes next to their name/names. Now you can click the Open Invoices tab. You can search by the due date to find the open invoice you want to pay. Check the box/es next to the invoice/invoices you are paying. Choose payment method. Enter in payment information and click pay. You can choose to print the receipt, view the paid invoice or close the box.